LOS ANGELES - American John Isner's serve was the key to his match against Marcos Baghdatis of Cyprus. 24 year old Isner advanced but not without a scare as he fell during the second round of the LA Tennis Open. He defeated Baghdatis 6-3, 7-6. After taking the first set easily. the only break in the second set came in the tie-breaker. Isner had four match points before spraining his ankle at 10 -10 in the tie-break. Baghdatis surprised Isner, forced him to change directions and Isner took a frightening fall. Baghdatis climbed over the net to help Isner and asked for ice. For a moment he held the ice bag on Isner's ankle. After taking a few minutes to recover, Isner was clearly favoring his left foot. Baghdatis hit the next shot long. With a set point on his racket Baghdatis seemed a bit rattled. Isner could barely walk. At this point, Isner appeared only capable of serving. On the fifth match point, Isner served to win the tie-break 13-11. Isner is ranked 77th on the ATP tour. He will meet qualifier Carsten Ball of Australia on Friday. Seeded eighth, Marat Safin battled Ernests Gilbus of Latvia 2-6,6-3, 6-4 to get to the quarterfinals. Safin's experience seemed to pull him through as he was being pummeled by Gilbus constant attack. Once Safin released his anger and threw his racket a couple times he seemed to settle in for the duration. He used his defensive skills and outlasted Gilbus for the win. German Tommy Haas dismissed American Jesse Levine 6-1, 6-3 in the evening singles match. 31 year old Haas won this tournament in 2004 and 2006. He is seeded No. 1 and plays Marat Safin (RUS) in the next round. In doubles, the Bryan brothers defeated Carsten Ball (AUS) and Kaes Van't Hof (USA) 7-5, 6-2. Yesterday, the Bryan brothers could be found bartending in the tournament lounge. Off the court they have been in the studio recording their first album. Follow the Bryan brothers at http://twitter.com/Bryanbros. The Legends featured match was Jim Courier and Stefan Edberg. They delighted the fans with drop shots and lobs. 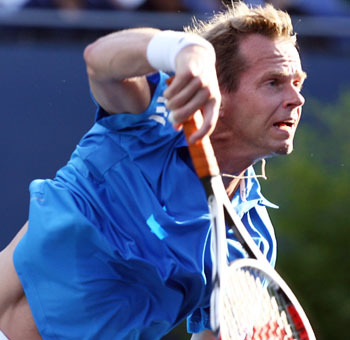 Edberg continued his classic serve and volley play while Courier maintained his baseball-like ground strokes. Edberg challenged a call and eagerly stated, "This is my first time," referring to the instant replay that did not exist when he was on tour. They split sets and Courier won the 10 point tie-break set. Stefan Eberg reached No.1 in 1986. He holds six Grand Slam titles, two Australian Opens, two French Opens, and two US Opens.